Most quick coupler mounts fit:* Case – Cat – Gehl – Gradall – Ingersoll Rand – JCB – Sky Trac – Carelift – KD Manitou – Lull Pettibone – Terex – LiftKing – Load Lifter – Traverse Lift – Other mountings available. 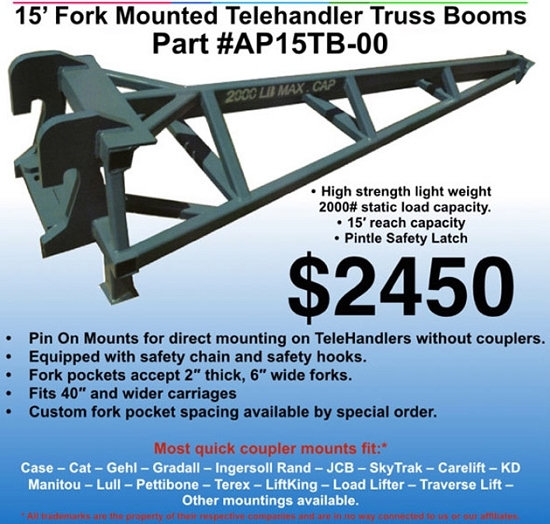 Pin On Mounts for direct mounting on TeleHandlers without couplers. Equipped with safety chain and safety hooks. Fork pockets accept 2? thick, 6? wide forks. Fits 40? and wider carriages Custom fork pocket spacing available by special order.